Air Europa has been talking up its ambitions in Latin America. It has firm orders for eight Boeing 787 aircraft, but its president Juan Jose Hidalgo recently said it will eventually have up to 22 of the type by 2020-2022. He plans to deploy them on Latin American routes. These could include Mexico City, Bogota, Cartagena and Quito. Currently, Iberia is the leader on all three routes to Latin America where it competes with Air Europa and is number one overall on Spain to LatAm. However, Air Europa has been picking up routes dropped by its larger rival and Mr Hidalgo says it plans “to fly all the destinations that Iberia flies to”. The pendulum is swinging towards Air Europa in much of the region outside Central America. Iberia has abandoned the Caribbean altogether. Air Europa has a unit cost advantage and ambitions to grow. This poses a credible threat to Iberia’s Latin American network. Iberia’s cost restructuring will have to succeed if it is to avoid a further dulling of its brightest network jewel. Air Europa said on 13-Sep-2013 that it surpassed Iberia for the first time in the number of daily services in Aug-2013, operating 214 services per day compared with Iberia’s 207 services per day. This probably does not take account of Iberia Express (or Iberia franchisee Air Nostrum) and so is technically overstating the relative positions of the two. According to Innovata, Iberia has around two and a half times the frequencies and seats of Air Nostrum overall and more than twice its seats on routes to Latin America. Nevertheless, Air Europa is a significant competitor to Iberia, a point emphasised by Sep-2013 traffic figures from AENA, which showed Air Europa to be the fastest growing carrier at Madrid airport (with growth of 23% year-on-year). Its plans to add long-haul aircraft contrast with the austerity imposed on Iberia by its parent IAG. IAG’s aircraft orders are like waiting for a bus. Three arrive at the same time. Latin America is an important part of the international networks of both carriers. Nevertheless, at first sight, they have strengths in different countries. 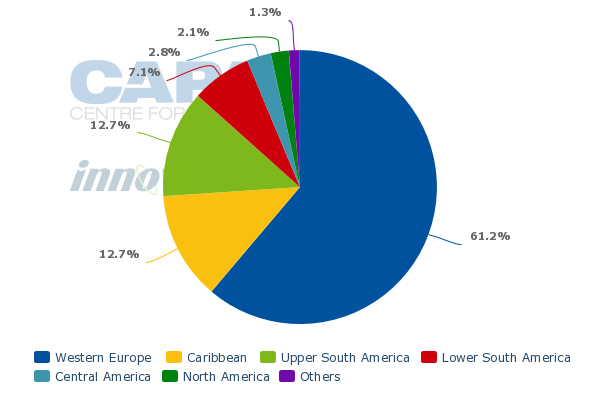 For Iberia, 52% of its seat capacity is international and 26% of its international seat capacity flies to Latin America. Its biggest Latin American countries are Brazil, Argentina and Mexico. For Air Europa, 44% of its seat capacity is international and 36% of its international seat capacity flies to Latin America. Its biggest Latin American countries are Dominican Republic, Cuba, Argentina, Peru and Venezuela. (Source for data: Innovata, week of 7-Oct-2013). 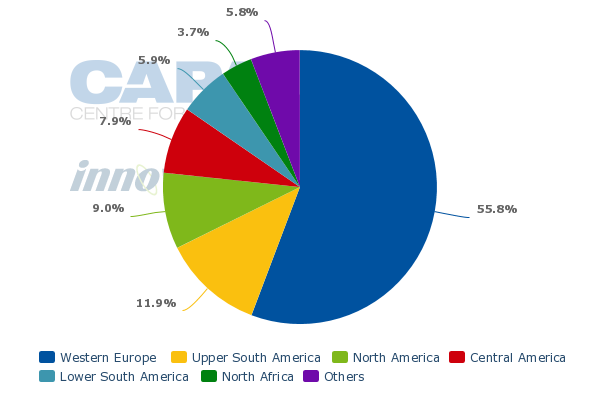 A glance at the top 10 international routes by ASK for each carrier reveals that the two only compete on three routes (Madrid to Buenos Aires, Caracas and Lima). Nevertheless, Madrid to Buenos Aires is the most important long-haul route for both carriers and Iberia has more than twice the capacity of Air Europa on the route. On Caracas and Lima, which are both in Iberia’s top five long-haul routes, Iberia is also the market leader, although Air Europa’s share is closer to it. 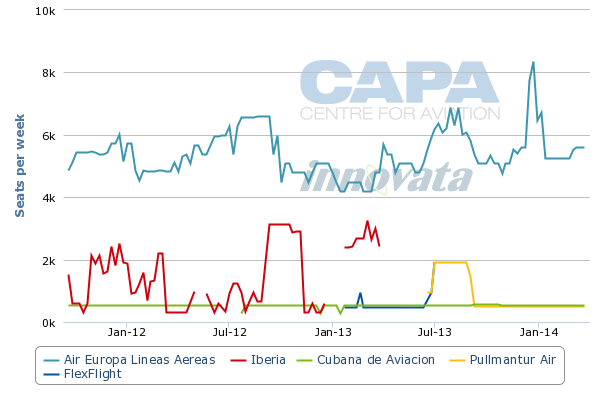 The relative shares of the two on these three routes has been fairly stable over the past couple of years, although Iberia has seen some erosion of its share to Lima and gained a little on the Caracas route (at the expense of CONVIASA). While Iberia’s seat capacity to Latin America is more than twice that of Air Europa in 2013, it has seen its capacity fall since 2011. Air Europa has also seen capacity fall since 2011, but at a lesser pace and it has grown in 2013 versus 2012. Moreover, while Iberia’s seat capacity to the region is roughly the same as it was in 2005, Air Europa has increased by 60% over the same period (data source: OAG). In 2003, Iberia operated four times as many seats from Spain to Latin America as did Air Europa to 2013. The story is similar on each of the sub-regions of Latin America, apart from Central America, where Air Europa has cut capacity and Iberia remained stable since 2011. Looking at the sub-regions in order of their overall size, ranked by seats from Spain, we consider Upper South America, Lower South America, Central America and the Caribbean. 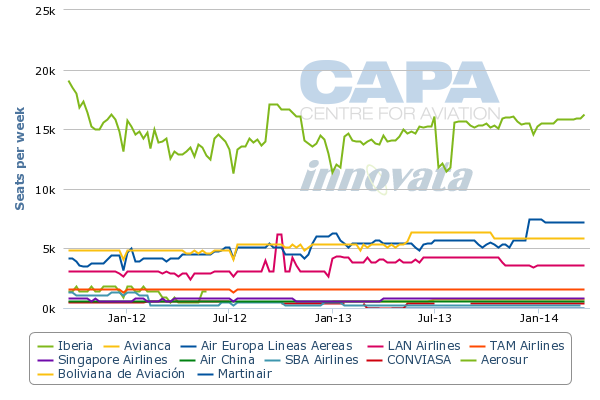 On Spain to Upper South America, Iberia is the market leader with 44% of seats, followed by Avianca with 18% and Air Europa with 16% (source: Innovata, week of 7-Oct-2013). However, capacity cuts by Iberia and growth by Air Europa in recent years have taken Iberia’s multiple of Air Europa’s seats from almost seven times in 2009 to less than three times in 2013. Moreover, Air Europa’s plans will see it step up capacity to Upper South America further in winter 2013/2014 and both Avianca and fourth-ranked LAN have increased their presence over the past year. 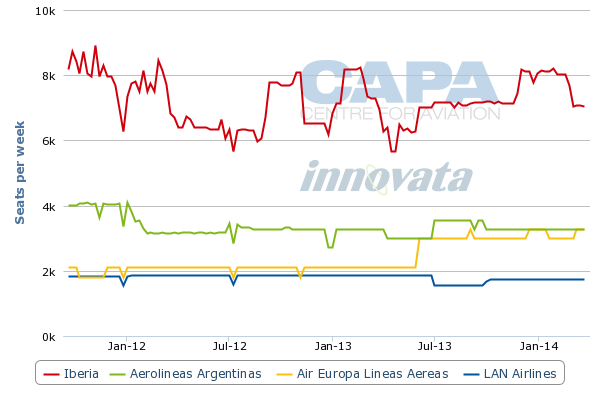 On Spain to Lower South America, Iberia is again the market leader with 47% of seats, followed by Aerolineas Argentinas with 22% and Air Europa with 20% (source: Innovata, week of 7-Oct-2013). Iberia is operating four times as many seats as Air Europa to the sub-region in 2013, but this multiple has fallen from 10 times in 2003 (and more than seven in 2009). 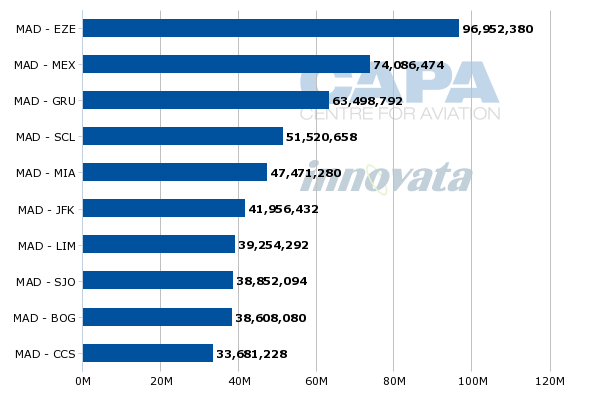 Air Europa increased capacity significantly in mid 2013, while LAN cut back a little. Turning to Central America, a lucrative market, this is the sub-region of greatest dominance for Iberia, with 72% of seats, followed by Aeromexico with 15%. 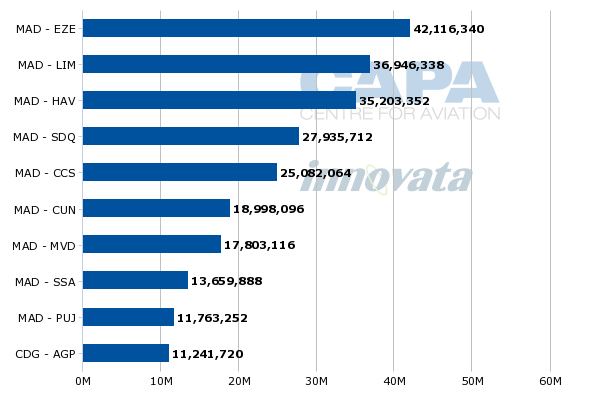 It is Air Europa’s weakest region: it has just 9% of seats from Spain to Central America (source: Innovata, week of 7-Oct-2013). Unlike the other sub-regions, Iberia has added capacity (albeit very slightly) since 2011, while Air Europa has cut capacity. In 2013, Iberia is operating a little less than three times as many seats as Air Europa to the sub-region. This multiple has risen from a little more than one in 2011, but has fallen from 3.5 in 2004 (and more than six in 2008). 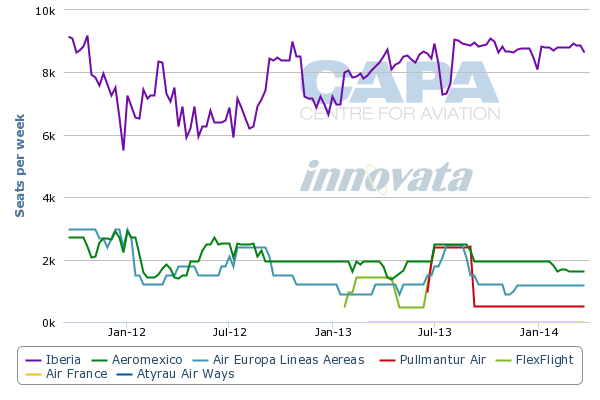 Newcomer Pullmantur Air now has a 4% share, gaining partly at the expense of Air Europa. Iberia has now abandoned the Caribbean, at least for now, having operated its last flight earlier this year. Its IAG sister carrier British Airways is now shouldering the group’s burden in Latin America. This prompted Spain’s industry minister Jose Manual Soria in Dec-2012 to call plans to re-route Iberia’s Madrid-Havana flight through London “unacceptable”. In 2003, Iberia had 40% more seats than Air Europa in the sub-region, but its capacity fell below that of its rival in 2007. Air Europa is now the clear market leader on routes from Spain to the Caribbean, with 84% of seats, its highest share on any sub-region. Cubana de Aviacion is second on 9% and new entrant Pullmantur Air has 8%. Air Europa has been watching Iberia carefully, opening routes such as Santo Domingo just as Iberia ceased operating them. A comparison of recent route changes to the Americas highlights the current difference in momentum for the two carriers. Since the start of 2012, Air Europa has opened five new routes, increased frequencies on five, reduced frequencies on one and ceased one. By contrast, Iberia has opened no new routes, increased frequencies on two, reduced frequencies on three and ceased five. Air Europa is reportedly planning to launch twice weekly Madrid-Asuncion service and to invest EUR91 million over three years in Paraguay, according to consultancy Mercapital president Ángel Fernández Álvarez (EFE, 03-Sep-2013). The route would be the first direct service between Paraguay and Europe, according to Innovata. On Madrid-Salvador, Air Europa’s frequency is to increase to daily from Nov-2013. It also plans onward connections to Santiago, Cordoba (Argentina) and Montevideo. According to Innovata, Air Europa is and will be the sole carrier on the Salvador services. Air Europa plans to increase Madrid-Montevideo frequency from spring 2014 following "success from day one" on the route, according Mr Hidalgo, who said it was the best performing route in the carrier's 20-year history (El Pais, 01-Oct-2013), with a load factor averaging above 80%. It plans to add two additional weekly Montevideo frequencies through its upcoming hub in Salvador. As often seems to be the case when the stakes are high, the battle of the South Atlantic has led to some posturing. Air Europa’s Mr Hidalgo is on the offensive, claiming that his carrier is increasingly seen as the preferred carrier for Europeans flying to the Americas and Caribbean, as well as the preferred carrier for Americans to travel to Europe. Iberia CEO Luis Gallego shrugs off the threat posed by Air Europa’s development of its Madrid hub: “Look at other European airports that are hubs and how many companies are there. It is not very sustainable to have two airlines at the same hub.” That may be the case, but this does sound very much like a recognition that Air Europa is indeed a threat. CAPA has estimated that Air Europa’s unit costs (cost per available seat km, CASK) are between EUR5 cents and EUR6 cents, well below those of Iberia’s EUR8 cent to EUR9 cent in spite of Air Europa’s longer average stage length. Nevertheless, Air Europa has been loss-making, suggesting that its product and network have not been able to attract the necessary premium. As it takes advantage of Iberia’s restructuring and capacity cuts to develop its network by growing in Latin America and elsewhere, its unit cost advantage could prove to be telling when Spain’s economy and demand for air travel strengthens once more. Meanwhile, cost efficiency is also on its agenda. IAG’s Mr Walsh and Iberia’s Mr Gallego are not the sort of airline managers to stick their heads in the sand over the issue of competition. At the moment, they are focusing on cost reductions at the loss-making Iberia, although the cost gap with lower-cost Air Europa looks too wide to be closed entirely. Perhaps they are hoping that Iberia’s superior network and product positioning will be telling once its restructuring is complete and its costs are lower.